The Adventures of Captain Proton, Chapter 18: "Bride of Chaotica" The evil Dr. Chaotica kidnaps Constance Goodheart and plans to sacrifice her to Arachnia, Queen of the Spider People. Captain Proton travels millions of miles to Planet X, where he will invade the Fortress of Doom. Chaotica fires his fiendish death ray--certain death for Proton, as his rocket ship bursts into flames. "We didn't burst into flames in the last chapter. Why are these recaps always so inaccurate?" - This episode's plot was conceived as a way to keep as much action as possible off the bridge, due to a fire which damaged that set (for more information, see VOY Season 5). - In the teaser, Harry Kim comments to Paris that the surface of Planet X looks suspiciously like the "Mines of Mercury" they had seen in a previous episode. This is an in-joke reference to the "Planet Hell" set used to depict many different subterranean or "cave" scenes since the first season of Star Trek: The Next Generation, including that very scene. - - Kate Mulgrew was delighted to perform Janeway's turn as Queen Arachnia, commenting, "That was the greatest fun. That was just wild fun. That was cut loose fun time. I mean those opportunities are few and far between for the captain. And I think everybody said, 'Oh well, let's just let Kate have a ball.' And I did." Mulgrew also remarked, "I was the bride of Chaotica. Only the funniest man I have ever met in my life. When he electrocuted himself, I wet my pants. It was just outrageous. And I go to seduce him. It's a cartoon! [....] I was playing a '40s movie star. It was outrageous, it was so much fun and I hope the viewers liked it as much as I liked doing it. [I] loved the double punch, [I] loved the curve and when there was a little levity attached to it... Heaven!" - Chaotica's death ray was previously seen as a weapon in the forests of Minos in the Star Trek: The Next Generation episode "The Arsenal of Freedom". Chaotica's throne was previously used as Minister Odala's chair in "Distant Origin" (as well as the alien throne in the 1993 film Coneheads). "Um, sorry captain. We lost two more replicators this morning..."
"Listen to me very carefully because I'm only going to say this once. Coffee, black." "Well, he's been attacking the aliens with his death ray." "It's a shame we don't have one." "This is how you've been spending your free time?" "Well, I've, uh, been studying how past generations view the future." "Well (chuckles), it didn't work out quite as black-and-white as they imagined." "Ah, I see you've kept my pheromones. I didn't realize you were the scent-imental type." "Isn't anybody going to sing 'Hail to the Chief'?" "Mr. President! How'd it go?" So, by coincidence, I'd recently started watching The Office, and, remembering that Rainn Wilson had had a small bit as one of the Thermians in Galaxy Quest, decided to take a look at the movie to see his bits in it, and ended up rewatching a big chunk of it even though I'd already seen it a few times already; it was that good. I also watched my first episode of Black Mirror, "USS Callister", which has a different, much darker take on space opera pop culture nostalgia, though not without its own bits of (very dark) humor, as I understand is not atypical for the show. So, some kind of interesting framing for rewatching this. And, as with rewatches of other episodes, it wasn't without its problematic aspects, from the quasi-Orientalist villain to Harry and Tom casually discussing "slave girls" and "Chaotica's harem" at the beginning. But that's another reminder that this is an episode that's nearly eighteen years old; not that there wasn't any critiquing of this sort of pop culture back then, but it was a bit less reflexive, I think. Even at that, there's some awareness, I think, of just how cheesy some of the Treknobabble and other franchise storytelling conventions are this episode, even in comparison to the old serial-style space operas--mapping "imager" to "viewscreen" and so forth. The Doctor's "President of Earth" outfit has a blazer pocket crest that's suspiciously similar to the United Federation of Planets seal, which in turn is based on that of the United Nations. If the episode doesn't really get into critiquing some of those old tropes, because that might reflect back on the show itself, it does so implicitly, mostly in the form of Janeway rolling her eyes at the role that she's playing even as she's vamping it up, and a bit more at Tom deciding that he's had enough of this holoprogram. I've always wished that the show might have snuck in one or two little bits of self-mockery, such as B'Elanna putting on Klingon armor and picking up a bat'leth and going in... and fitting in perfectly. Ah, well. Poster's Log, Supplemental: Seeing Robert Picardo in a suit and glasses reminds me of his more recent role in the Coen Bros.' Hail, Caesar!, a period piece within a period piece. Particle of the Week: The humble photon is a clear winner. * Maximum Possible Photon Torpedoes: 2. * Janeway's Big Red Button: 2 aborted self-destructs, 1 successful, 1 game of chicken, 1 ramming speed. * I love Captain Proton. It's not without its problems, which Jack has already gone over to my satisfaction. I was pleased that Janeway caught what was going on with the pheromones, at least. However, apart from that, I do love Captain Proton - the crappy sets, the robot, the monochrome background. The robot. Spending most of an hour there was pretty fun no matter how little sense it makes. I enjoyed Mulgrew as Arachnea. * I would've liked more with the photonic lifeforms. On the face of it, it's an interesting idea: extradimensional photonic aliens in suits. But it isn't really explored - the war occurs offscreen, they never really get to talk. though not without its own bits of (very dark) humor, as I understand is not atypical for the show. Black Mirror is pretty soul crushing. I'll have to check out that episode when I get a minute. Hehehehe, yeah, that would've been great. I guess I'm content with the level and style of self-examination that they DID do here. It's sort of a snarky version of "Far Beyond the Stars" inasmuch as it directly engages with the roots of Star Trek. And it's more metatext than we might have expected from Voyager. I thought they maintained the right tone throughout: light, but not SO light that we tune it out. (YMMV there, I expect.) And McNeill's scene where he briefs Janeway in the corridor was so much more fun and engaging than most walking-the-corridors-of-Voyager scenes. You play STO and you haven't seen this yet?! Wait no longer. I feel confident that you will like it, or at least be fascinated. I wouldn't call "Callister" soul-crushing. I can't compare its degree of darkness to other Black Mirrors, since I've only seen one other one so far (the first one). I guess I'm content with the level and style of self-examination that they DID do here. You play STO and you haven't seen this yet?! Wait no longer. Heh. Fair enough. I did watch it this morning because I'm waiting to head out for an appointment anyway. I can't compare its degree of darkness to other Black Mirrors, since I've only seen one other one so far (the first one). I would rate it as 'shockingly lighthearted' compared to most offerings I've seen. It's a good episode anyway because it does the thing that I generally like about the show: extrapolates how people would misuse technology. Given Daly's gear, I think most people would go Charlie X, probably including me. So, for meta reasons, it makes sense that the entertainment in future cultures in science fiction is backward-facing: making the guys in Star Trek all fascinated by stuff like the 20th century or the Old West or Captain Proton is both cost/energy saving and helps viewers relate to them. Plus, it's not weird for most people to be into that: in real life, a lot of folks are all about an idealized or fantastical past, so it's an easy sell. However, I would love to see science fiction within science fiction - like, what does the Starfleet equivalent of a modern day Trek nerd do? What do they fantasize about that's not possible? Anyway, just something I was mulling over after I watched this. What Jack said about this episode seems about right to me, there is both a self-critique and some self-congratulatory moments in the episode, with some of the latter, now seen from a distance, being a bit questionable themselves. 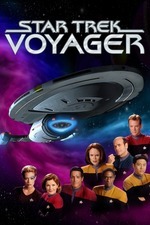 I don't mind that since the very nature of drawing the comparisons in both the things that have remained similar and those that have changed between the early screen sci-fi and Voyager also opens the viewer to what has changed since Voyager aired as the sort of meta-level approach, once initiated, doesn't end with the show's original airing. Setting all of that aside for the moment, this episode is quite entertaining if nothing else, with the actors playing the holodeck roles being really well chosen. I was greatly amused by the robot this time around, and Martin Rayner as Doctor Chaotica finds the right balance in being authentic enough to the era of the alleged serial and still being just exaggerated enough to add something more, Nicolas Worth as Lonzak too seemed apt for his role fitting the lumpen sidekick role well and still doing a bit more to make it fit the show. The music cues and all the not so special special effects were lovely and the idea of Chaotica running a war on the holodeck unbeknownst to the crew itself was an excellent little idea. The main cast also obviously had fun with this one, and that comes across well and the dialogue was able to support their enjoyment. The only thing I have some lingering mixed feelings about is in the wrap up, where the photonic beings from the "fifth dimension" just disappear. As mordax noted there is something a bit disappointing in that on the one hand, not only for the missed opportunity to get to know those beings better, I was hoping for one of their typical "swanky" ambassador parties in the mess hall with Neelix trying to serve holo-canapes to black and white light beings. But even beyond that there is just the sort of neglect to tie up some of the issues surrounding Voyager having accidentally started a war with these beings that killed at least 57 of them and in even treating the encounter as a "real" first contact event with an advanced race. At the same time, the more metalevel concept of these beings who seemed to come from the black and white tv age being killed without notice fits the changing times much like that of the "good guys" not being able to be killed, other than poor Constance Goodheart, which goes to the instability between old and new in that way. I'm not sure how the show could have wrapped up things in a manner that would both treat the events as serious in their way and fit the lighter tone of the rest of the episode or whether that would have in fact made the episode any better by drawing attention to that area of imbalance. In some ways it might have robbed the episode of attention to the things that did work by trying to sum up more than could be done at the last minute. Since the episode does close with the cast still on the holodeck, one could speculate they dealt with some of the other questions later and as an ending(?) what they had was awfully good so I'd be wary of asking more in hopes of improvement, but there is still a tinge of concern about it all as well that I can't fully reconcile. All in all though this was an excellent start to the new year of rewatches. Hmm, one guess would be that speculative fiction around eugenics or human enhancement might still be of interest since it is banned and could still carry some ways for stories to be based around a different perspective, but with god like beings, time travel, and faster than light travel and a galaxy of aliens, maybe it futurist fiction would be less about technological advancement itself and more about cultural clashes and values. I mean they could write about encounters from other galaxies and as yet undiscovered new forms of life, but I'm thinking the science/tech part of the equation might carry less interest than talking about clashing civilization values. But even beyond that there is just the sort of neglect to tie up some of the issues surrounding Voyager having accidentally started a war with these beings that killed at least 57 of them and in even treating the encounter as a "real" first contact event with an advanced race. Hmm, one guess would be that speculative fiction around eugenics or human enhancement might still be of interest since it is banned and could still carry some ways for stories to be based around a different perspective, but with god like beings, time travel, and faster than light travel and a galaxy of aliens, maybe it futurist fiction would be less about technological advancement itself and more about cultural clashes and values. There's an FPP now about a talk that MeFi's Own cstross did that starts out with the observation that writing even near-future SF has become harder and harder, due to the acceleration of change. In Trek, in the TNG era, you've got the situation where the appearance of a god-like being is usually met with "oh no, not him again." Getting at your point... huh. That's... so weird to even consider. That may be one of the reasons why the various showrunners started shying away from continuing in the same continuity following the end of VOY. I imagine the likes of Stross would say yes too, and that prior to (pop-)futurism, everybody's otherworldly fascination was the afterlife. In a sense, sci-fi IS our "after-life." Now I'm mostly miffed I can't check - this is the sort of change that would take generations to unfold, and we're nowhere near the limit right now. The accelerating weirdness he talks about in his presentation isn't really a check on futurism, it just makes it wicked inaccurate right now. Like, instead of getting really prescient stuff, we're seeing more weird teen dystopias and things.